Dance In The City - Renoir tapestry is based on the original painting by Auguste Renoir (1841–1919) from 1883. Here, as in its companion work, Dance in the country, shows a lady and gentleman in a formal dance, in formal dress. The works of Renoir was in impressionism style, and represented life in France in the 19th and early 10th century. The original now is displayed in the Musee d’Orsay, Paris. 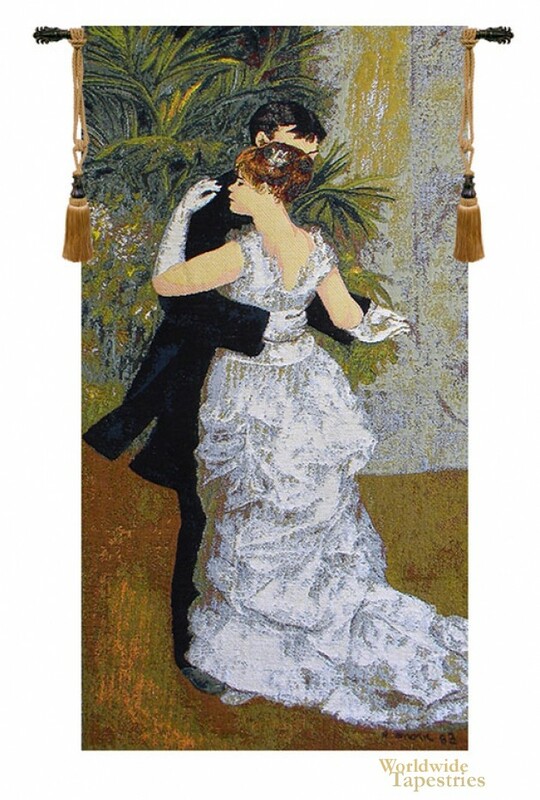 This fine art tapestry Renoir's Dance in the City is backed with a lining and a tunnel for easy hanging. Note: tapestry rods and tassels, where pictured, are not included in the price. Dimensions: W 19" x H 36"
Dimensions: W 28" x H 54"